The 2018 Longines Global Champions Tour season blasted off in tremendous style with a sizzling victory for Eduardo Alvarez Aznar (ESP) in the opening one-round 1.45m speed class in Mexico City. 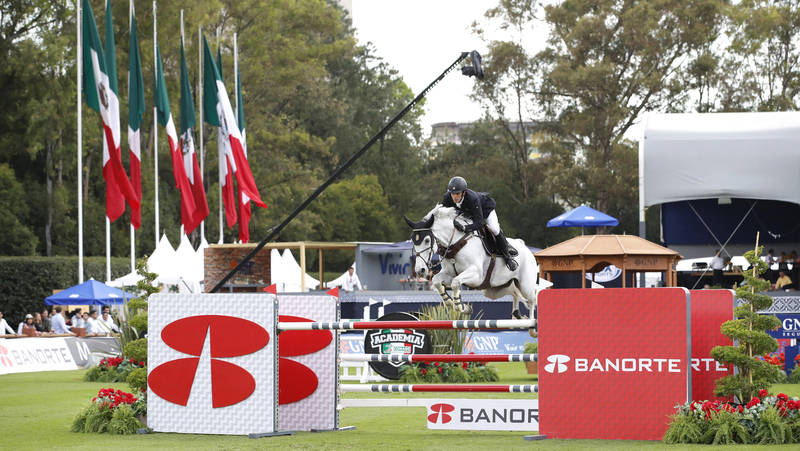 Mexico’s vibrant capital welcomes many of the top names in show jumping for the season opener for the Longines Global Champions Tour and GCL team series and this early taster of what’s to come provided an intense spectacle at the start of four days of world class competition. This week’s classes are being held in the vast lush turf arena at the Campo Marte equestrian venue in the Avenue Paseo de la Reforma, which hosted the 1968 Olympic dressage and individual jumping events, and excited fans and passionate spectators packed the stands in anticipation of a show packed full of exhilarating sporting action. This is the third time the Longines Global Champions Tour series has visited Mexico City and the curtain-opener offers a fantastic opportunity to welcome the return of some of the best combinations in the sport, all of whom are looking to climb the LGCT rankings. A total of 57 combinations lined up for Thursday’s class, which was stacked full of Olympic champions, championship medallists and the very best riders in the world. Egypt’s Abdel Said with Jumpy Van De Hermitage kicked off with a steady clear and many riders followed suit as they carefully found their feet over this inviting track. But with plenty of prize money on offer, the pace upped throughout the class and GCL U25 rider Megane Moissonnier (FRA) riding Umours Batilly took the mantle with a smart and quick clear (63.55s) to hold the lead through the early portion of the competition. Plenty of new horsepower was on display, with some looking fresh on their seasonal debuts, and there were several strong performances from the likes of Nicolas Pizarro (MEX) with Carquilot, Simon Delestre of France with Teavanta II C Z and a particularly eye-catching round from Pius Schwizer (SUI) with the 11-year-old Balou Rubin R who took eventual sixth and look spot on for some big wins this season. Midway through the card, a new leader came in the form of Shane Breen (IRL) with the highly talented 10-year-old mare CSF Vendi Cruz, by ARS Vivendi out of a Cruising mare. A powerful and smooth round put them well into the lead in a time of 62.70s. Great Britain-based Shane will be making his GCL debut tomorrow for the Miami Celtics. But drawn late, Spain’s Eduardo Alvarez Aznar and the galloping 13-year-old grey Fidux soared into a mighty lead, 2.62s clear of the rest of the field to claim a sensational victory under the setting sun. Many of these combinations will be returning tomorrow for the first round of the GCL where 19 enviably high calibre teams featuring 25 out of the top 30 riders in the world begin the quest for a place in the team finals in Doha, Qatar, in November and to earn a golden ticket to the GC Prague Play Offs in December. With a 1.45m two-phase for individual riders earlier in the day, Friday is set to provide non-stop entertainment, it will be fascinating to see how things unfold. Tune in to all the action on GC TV, and keep up to date on the official social media platforms with all the behind the scenes action.